As mentors it always feels good to see the enthusiastic participation and get a good feedback from you for our initiatives. Thank you for your appreciation in Think, Learn and Perform (TLP). As TLP got over last week, we have been getting a lot of requests to continue the initiative. TLP was designed to help you understand the demand of the questions and improve your writing skills. 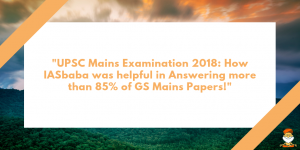 Also, the program was designed in such a way that you can easily complete and revise the entire GS mains syllabus and get a proper writing practice. The plan was made in such a way that it ends well before the prelims so that you can focus on Prelims. However, we have got many mails for continuation of the program. In order to maintain the continuity of the program, we will extend it for one more month (Till February). In extended Phase – I of TLP we will be posting the questions from current issues pertaining to different GS subjects. This will help you to relate the current issues with static topics as well as these issues will also be helpful in prelims preparation. So fasten your seatbelts once again for a month long joy ride of learning and improvement towards the destination of success. Everyday four questions will be posted based on a particular GS paper as per the schedule shared below. We will provide feedback to as many answers as possible, posted on the platform before 9pm. Take the feedback positively and try to improve every single day. Daily writing can ensure your selection but daily improvement is more important as that can ensure a top rank.